Directed by Orlando Lippert. Written by Al Weeks. Featuring John S. Knight, Kirby Grant, Frank Dane. B/W, Sound, 28 minutes. The Editor’s Notebook is a salute from one titan of Chicago media to another. 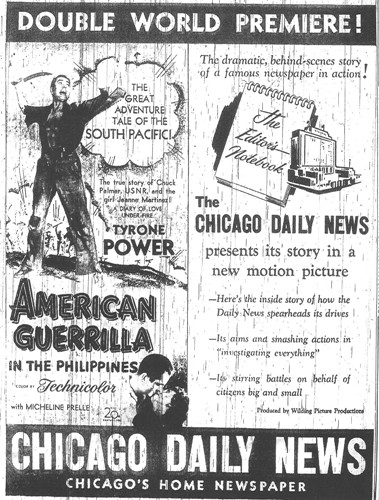 A sponsored film produced by Wilding Picture Productions on behalf of the Chicago Daily News, The Editor’s Notebook mixes documentary footage, staged recreations, and interviews with the newspaper’s staff to illuminate and explain the work of the Daily News and the importance of a free press in American democracy. As both Wilding and the Daily News are long defunct, The Editor’s Notebook also provides an entertaining and accessible look at media companies whose legacies have no present-day corporate guardian or benefactor. Traveling salesman Norman E. Wilding began Wilding Picture Productions in Detroit in 1914 and quickly grew the business into one of America’s most prominent non-theatrical film production companies. Wilding eventually opened offices in Cleveland, New York, Hollywood, and Chicago. For its Chicago hub, Wilding bought out and renovated the city’s most storied production facility in 1937: the Essanay studio at 1345 W. Argyle Street, briefly home to Charles Chaplin more than two decades earlier. At its height, Wilding’s Chicago operation boasted three sound stages, a carpentry shop, a screening room, editorial offices, and two generator trucks for location shooting. By the mid-1950s, the studio was turning out over a hundred sponsored films a year and had a client roster that included such corporate heavyweights as General Electric, Ford Motor Company, Chrysler, U. S. Steel, and Standard Oil. Although the Chicago Daily News aspired mainly to local circulation, its brand was just as storied as the national firms that regularly commissioned work from Wilding. Founded in 1876, the Daily News was an afternoon newspaper that shepherded major innovations to the field of journalism (including foreign bureaus and daily columnists) and provided column inches for quintessential Chicago journalists such as Carl Sandburg, Ben Hecht, and Mike Royko. By 1949, the paper had earned six Pulitzer Prizes, saw an average daily circulation of more than 500,000, and so sought to burnish its legacy with a sponsored film. Named after the weekly column from Daily News editor John S. Knight that ran each Saturday, The Editor’s Notebook would be in production for eleven months before premiering in November 1950. Scripted by the Daily News’s Al Weeks and directed by Wilding’s Orlando Lippert, The Editor’s Notebook sketches a day in the life of a major metropolitan newspaper and its employees. Our guides are fictional Daily News employees: Len the dogged reporter (Kirby Grant) and Dave the fearless photographer (Frank Dane). 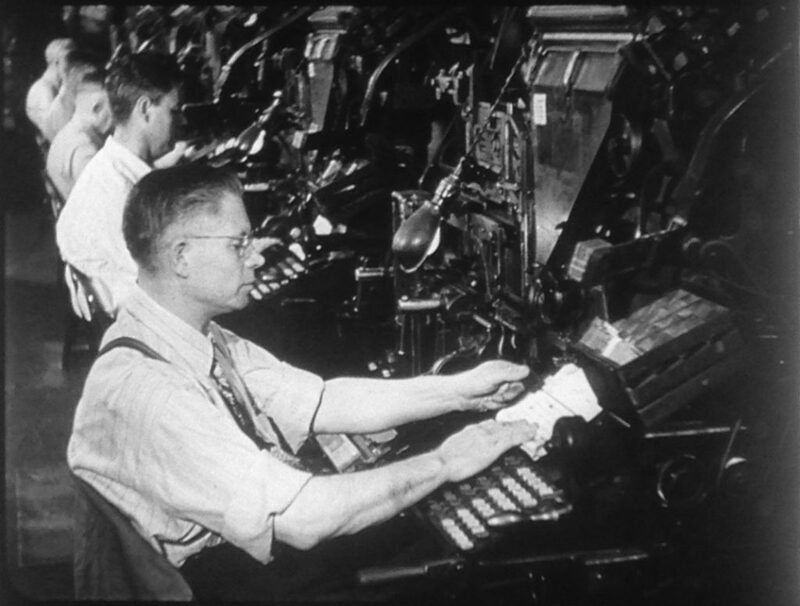 The film also finds time to include lengthy remarks from Knight on the moral and social obligations of the Daily News, as well as a concise history of the publication and a recap of recent major scoops broken by the paper. Special attention is paid to the paper’s efforts in uncovering a classic Springfield scheme that placed thirty-seven newspapermen (none of them Daily News men, naturally) on the state payroll—a story that garnered a Pulitzer Prize for Meritorious Public Service during the production of The Editor’s Notebook. The real-life scenes documented in “The Editor’s Notebook” are the factual daily dramas of a big city that frequently find their bigger-than-life representation on American movie screens. Hollywood is endlessly intrigued by the dramatic possibilities inherent in the printing of the daily newspaper, judging by the frequency with which such screen dramas are turned out. “The Editor’s Notebook” would make a first rate source for screen material. The Editor’s Notebook was booked for four weeks at the Woods Theatre and then filtered out to neighborhood houses like a standard short subject. Both 35mm and 16mm print requests were handled by the non-theatrical distributor Modern Sound Pictures, with the usual sponsored film proviso that The Editor’s Notebook circulate to any interested group for the cost of shipping. The film was further made available through the 16mm library consortiums operated by the University of Illinois and the University of Wisconsin. Many Daily News staff would migrate to the Sun-Times, though the paper’s interest in promoting the historical patrimony of its onetime rival would prove fleeting. Today back issues of the Daily News are available on microfilm at various Chicago libraries, but have not yet been digitized or indexed by online newspaper database services such as ProQuest. Although only a brief chapter in the histories of Wilding and the Daily News, The Editor’s Notebook offers a glimpse of corporate autobiography that has been orphaned by the very media forces it celebrates. The Wilding Pictures Productions library does not survive intact. Credible sources indicate that the company’s original elements were destroyed decades ago, leaving many titles that survive only as projection prints. 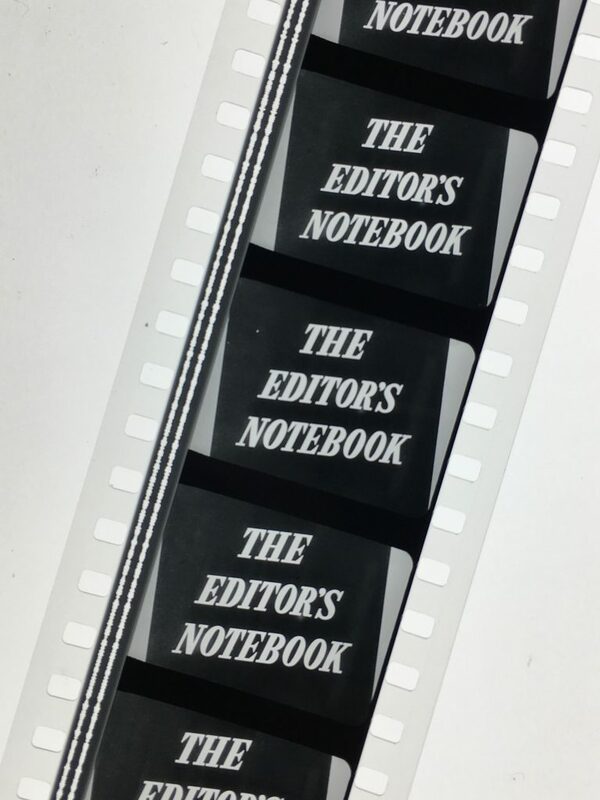 The Editor’s Notebooks was preserved using two 35mm composite prints–one held by Chicago Film Society, the second by the Library of Congress. Taken together, both prints provide the complete picture and soundtrack to The Editor’s Notebook. A new 35mm internegative was created at FotoKem, using the most complete source for each shot. DJ Audio, Inc., produced a 35mm re-recorded optical soundtrack negative following the same continuity. FotoKem produced two new 35mm composite prints from the new internegative and track negative. Funding for the preservation of The Editor’s Notebook was generously provided by the National Film Preservation Foundation.